It amazes me how prevalent gluten issues seem to be. On my way to Denver, once again, I jotted some notes. Mind you, I did not request to be seated next to people who had health issues that very well could be or are linked to gluten. In only one example below did the person know she was intolerant to gluten or had celiac disease; the others had no idea the ailments mentioned could be from gluten and perhaps dairy. Certainly there is enough research in my book discussing such connections to gluten, not to mention stories of lives turning around by going GF, that anyone with these symptoms or ailments might want to take testing seriously. It seems life only gets worse if gluten related issues are ignored. As usual I always suggest requesting the 4 blood tests you will find spelled out in Chapter 16 and if negative on those or if they are not covered by insurance don’t stop until you read Chapter 17 and do the very sensitive stool tests (not your ordinary lab/hospital tests, but a patented specific test that will likely detect intolerance if it exists). Try to find a doctor who is familiar with gluten issues, and bring your list of tests or you probably won’t get enough to discover celiac or intolerance to gluten. On the first leg to Denver I chatted with a woman who had weight issues. I relayed to her that many folks I’ve spoken with dropped 10-40 lbs. without trying by following a gluten-free lifestyle. The weight just sort of peeled off in nearly every case. I lost 10-15 myself without trying. There is scant research backing this up (because little has been done), but there is one study basically saying those people who are so thin due to celiac weight-loss begin to put weight on when the gut heals and those who are overweight begin to lose it. * Also, her grandson who was very smart was also very hyper. I mentioned a couple stories on ADD/ADHD and heavily suggested the parents get the child tested. But it’s the same old story: you need to know what to ask for or you probably won’t get enough testing and may be told you don’t have a problem with gluten when in fact you may be quite gluten intolerant. On the second leg to Denver I sat next to a woman who ate no grains. If she gets hit with a grain her head becomes foggy, ears plug up, she fills up with mucus and her lungs feel heavy. It takes 1-2 weeks for symptoms to lift. On the first leg back to NE I sat with a woman whose son died of cardio issues while running a race. Research exists in Toxic Staple on one form of atrial fib and cardiomyopathy that will resolve with a GF diet. ** You will also find a few studies on heart disease. Of course, so much more research needs to done. It wouldn’t be difficult to take a hundred newly diagnosed patients with atrial fib or cardiomyopathy and ask them if they were offered testing for gluten-related issues. My educated guess would be less than 5%…and that’s being generous. Testing for gluten-related illness should be at the top of the list in my estimation; there is just too much bad health linked to gluten and so little is being done to educate our doctors. On the leg back to New England I sat next to a young woman who was dealing with facial skin problems. So many skin problems can be linked to gluten and/or dairy as discussed in Chapter 11: The Skin You’re In. I mention nearly 20 skin disorders that you never heard of before, and it’s very likely barely 5% (that’s being generous again) of skin specialists have heard of their link to gluten. Skin issues can be a sign of unwellness, and many of them will clear up or get miles better once your gut heals with a GF lifestyle. 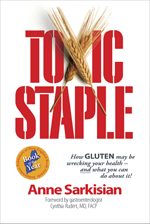 The purpose of these scenarios is to make the reader aware of some of the numerous and varied symptoms and maladies linked to gluten so they can become empowered to be their own advocate in conjunction with their doctors in seeking better health. Your best health lies in your very own hands. Cheng, J., P. S. Brar, A. R. Lee, and P. H. Green. “Body Mass Index in Celiac Disease: Beneficial Effect of a Gluten-free Diet.” Journal of Clinical Gastroenterology 44, no. 4 (2010): 267–71. Callejas Rubio, J. L., N. Ortego, A. Diez-Ruiz, J. Guilarte, and J. De la Higuera-Iorres. “Celiac Disease Presenting as Chronic Anemia Associated with Heart Block.” American Journal of Gastroenterology 93 (1998): 1391–92.